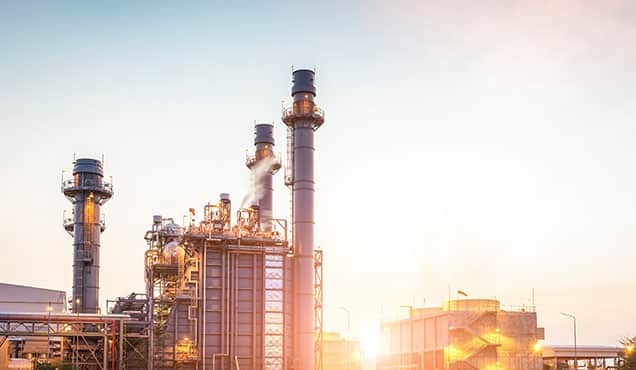 Despite continued negative press surrounding the operational, technical, ecological and even economic rationale for installing exhaust gas cleaning systems to comply with the upcoming 2020 bunker fuel specification change, IHS Markit records a slightly accelerating uptake of scrubbers. In May 2018, IHS Markit's Maritime and Trade team counted 510 vessels with scrubbers fitted or on order, an increase of 90 ships compared to March 2018. 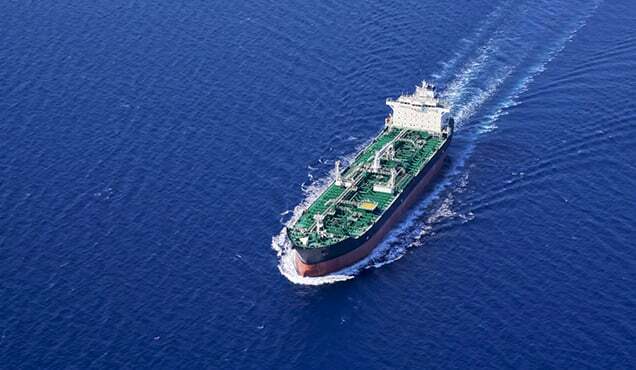 This increasing appetite supports IHS Markit's view that more vessel owners would see a compelling economic case to source discounted high sulphur fuel oil from 2020 onwards. 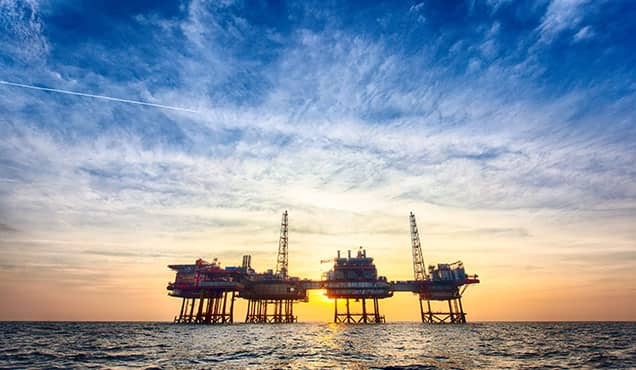 IHS Markit's Maritime & Trade division has been tracking installations of exhaust gas cleaning systems - commonly referred to as scrubbers - worldwide since the run-up to the 2015 sulphur specification change in the European and North American Emission Control Areas (ECA). In August 2014, IHS Markit's count showed just 140 ships with scrubbers fitted or on order. The introduction of the 0.10% sulphur bunker limit in the ECAs, effective 1 January 2015, spurred an increase in interest, and by January 2017, there were 305 vessels with a scrubber installed or on order. When the International Maritime Organisation (IMO) voted to introduce the 0.50% global bunker fuel sulphur cap for the high seas in October 2016, there was an expectation that shipowners would react, and start fitting a significant number of units before implementation of the new limit in 2020. The fuel oil availability study used during the IMO's decision making process assumed 3,800 ships would be burning scrubbed high sulphur fuel oil on the 1st of January 2020. However, this rapid growth failed to materialise. High-profile market players, including container majors Maersk and Hapag-Lloyd, diversified ship owner and manager Bernhard Schulte, and tanker companies Euronav and Teekay all expressed their preference for buying compliant low sulphur fuels, and said they would not be installing scrubbers on their fleets. 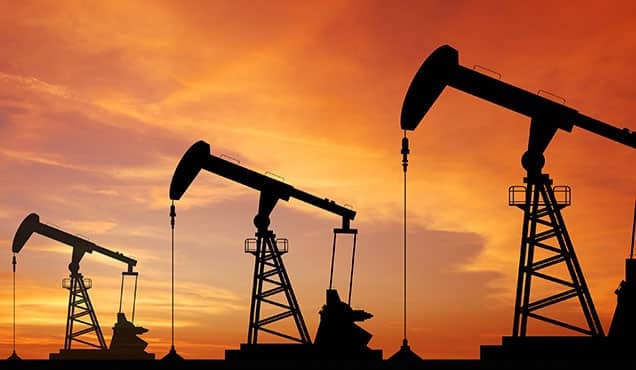 Common reasons to forego the scrubber option include policy uncertainty with regards to open-loop scrubbing, the high upfront capital investment, and question marks around the availability of sufficient quantities of high sulphur fuel oil at the necessary ports of call. Further complicating the equation are the ambitions to reduce greenhouse gas emissions and significantly reduce the carbon intensity of shipping. In April 2018, the Marine Environmental Protection Committee announced its decision to cut nominal greenhouse gas emissions from shipping by at least 50% by 2050, compared to 2008 levels. 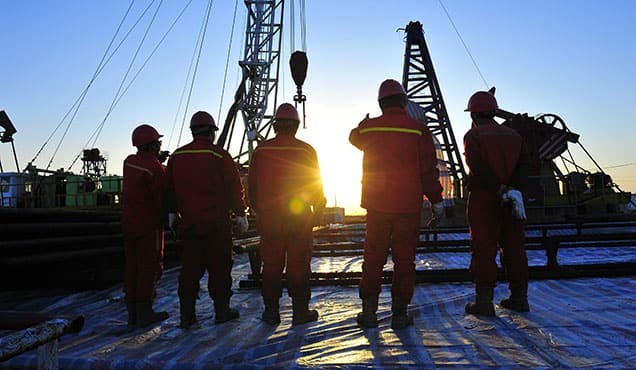 Additionally, there is an ongoing effort to reduce CO2 emissions per transport work, by at least 40% by 2030, and 70% by 2050, again compared to 2008. As scrubbers require additional energy, their use increases the vessel's CO2 emissions, which would require shipowners to take additional CO2 emissions reduction measures. 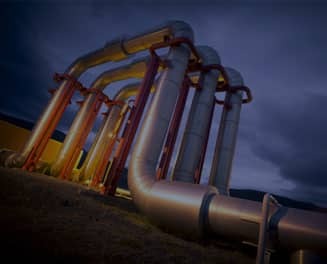 However, as the first milestone in 2030 is still 12 years away, there may well be a sizeable window of opportunity to monetise scrubber installations in the medium term. 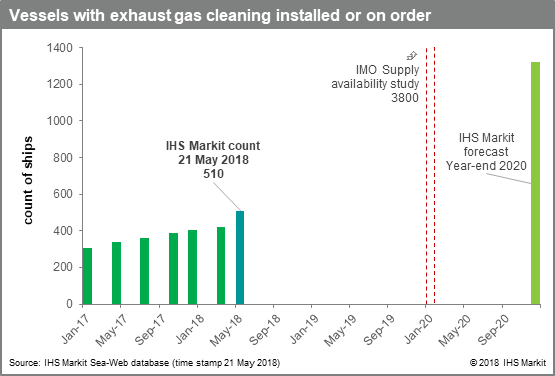 IHS Markit's latest count, dated 21 May 2018, shows a notable increase to 510 vessels with exhaust gas cleaning systems fitted or on order. This represents an increase of ~90 ships in just two months. The data suggests a 50/50 split between retrofits, and new builds, and the orderbook includes all vessel categories, including large merchant vessel classes such as bulkers, tankers, vehicle carriers and container vessels. Recent announcements include commodities trader Trafigura, Seatankers Management, Songa Shipmanagement, Grimaldi, and further new building activity by early scrubber adopter DFDS. Looking forward, we expect a steady increase in scrubber installations, as more vessel owners make up their minds with regards to how they will comply with the new sulphur limit. 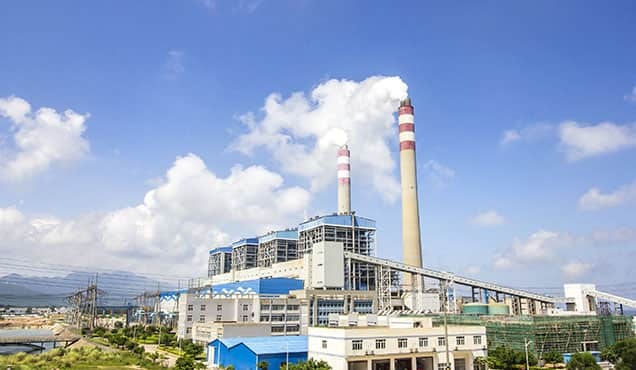 A strong ramp-up of scrubber adoption is still anticipated from the fourth quarter of 2019 onwards. 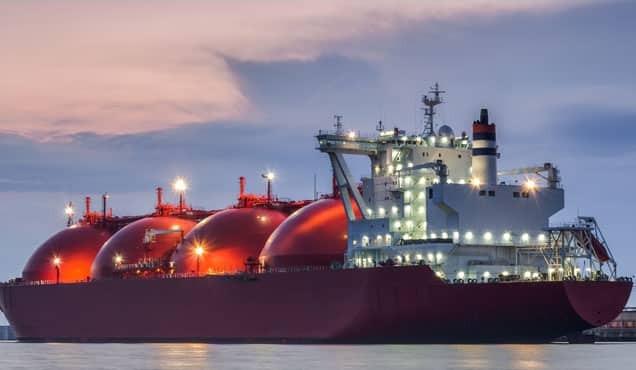 IHS Markit believes that this will be supported by an acute widening in the light-to-heavy product differential as the scramble for compliant fuel begins, as well as the realization that scrubber technology has been successful - technically and commercially - for other large vessels. 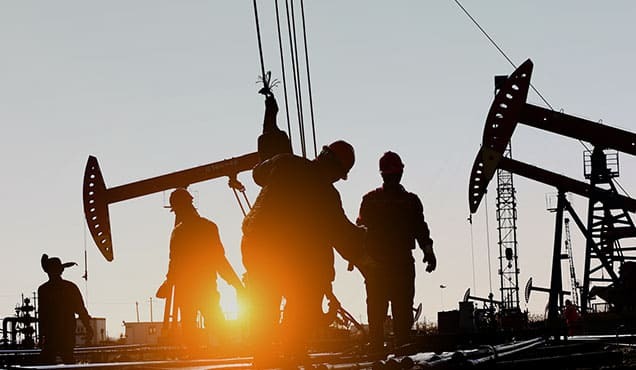 By year-end 2020, IHS Markit forecasts that just over 1,300 ships of the 55,0000 large vessels in the merchant fleet will have scrubbers installed, and that this number will increase further in 2021-2024, on the back of further reactive retrofits, and delivery of newly built vessels with scrubbing on board.